There are number of rectangular tank-style models in 1940's lineup. Usually the 1940's watches are a little small by today's standards. However, a few are actually a decent size... still small but not "too small". A good example of a nice-sized tank-style watch is the 1941 Wesley. It must have been a popular watch, as it was made through 1952. 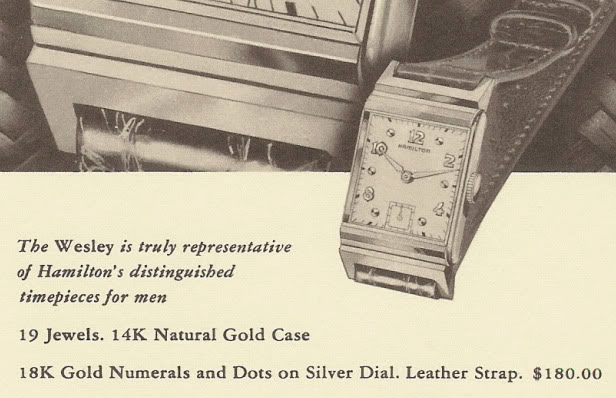 There are probably a dozen or more rectangular watches in the 1941 line up. Few 1941 models were also available in 1949. 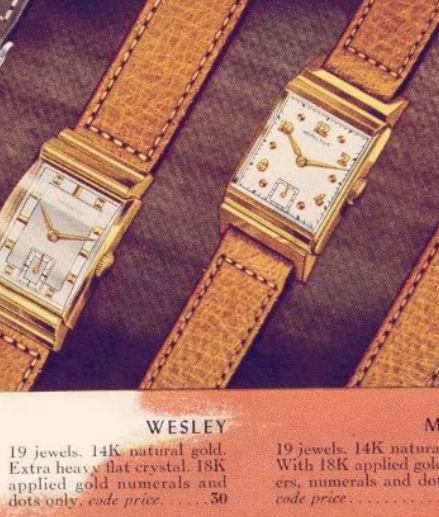 As you can see in the catalog snips, the Wesley came in a 14K solid yellow gold case. Under the dial is a 19 jewel 982 Medallion movement. The 982M was introduced in 1940 and replaced the high grade 982 movement in solid gold models. The 982 and 982M are virtually identical other than the additional damascening and gold (orangish) highlights on the movement back. The 982 was used after 1940 in 14K gold filled models. One of my friends asked me to take a look at his new Wesley. He had picked it up in a local shop and it briefly ran for him but then cut out. As received, it was a very attractive looking watch... not the usual likes of my typical project watches. The dial appears to be original and darned near new. A lot of people use the term "mint" with watches, which is funny since watches aren't made in a mint. But this sterling silver dial with solid gold numerals and markers sure looks "factory fresh". The earlier 982M actually have a gold medallion inset into the train bridge. The last few years of 982M's lost the medallion and just got a inset enamel circle. When I first opened the watch, the regulator was set to "super slow", meaning it was pushed to the right, almost over the center wheel. I pushed it back to the center, just to take the strain off the poor hairspring. With the dial out of the way, one thing is readily apparent. There is a ton of excess oil inside. Look at all the oil that has pooled on the top of the main plate. I suspect it's from the mainspring barrel. With the ratchet wheel and the smaller winding wheel out of the way, you can see there's a lot of excess oil on the barrel bridge too. If any of this oil got onto the hairspring it would make the watch run very fast - thus the probable reason for someone pushing the regulator to super-slow. Opening up the mainspring barrel, I was a little surprised to see an older blue mainspring. You'd think if someone serviced this watch and put so much oil inside, they might have replaced the mainspring... but not in this case. These old blue steel springs tend to "set" after a while and lose a lot of their energy. The watch will run fine, but it won't run as long. With a fresh mainspring, a well maintained 982M should run 40 hours or so on a full wind. I like to use genuine Hamilton Dynavar white alloy mainsprings whenever possible. Here you can see the difference between an old "set" spring and new mainspring. A new mainspring will actually coil in the opposite direction. The best way to install a new mainspring is with a mainspring winder. There are many different styles of winders but I like to use a K&D variable diameter model. It allows me to use the same winder for different sized barrels. Everything is cleaned and dried before getting reassembled with fresh oil - and a LOT less of it than was in there when I started. The now cleaned movement is running nicely. It's off to the timer from here to see how well it's running. Watch timers listen to the ticking and compare what it hears to what it expects to hear. In this case, the timer is picking up extra noise inside the watch. I suspect there is a tiny fleck of dust on the hairspring - just enough to make a sound but not enough to really bother the balance motion. I cleaned the hairspring again and carefully inspected it. Now the watch is running exactly as it should. Everything looks great. I'll leave it running a little fast for now. I didn't have to do too much to the outside of the watch, to be honest. I gave it a gentle polish and called it a day. This Wesley dates to 1948 based on the movement serial number. It now runs as great as it looks. Just for comparison's sake, check out the relative large size of a Wesley compared to it's 1941 sibling, the Gilbert. The Wesley is considerably larger. I was given a Wesley by a friend just days before he passed away. I'm assuming it's Wesley because it is identical to the one shown here and I can just make out a W and 14k Gold on the back. I'd like to honor him by getting it repaired. The stem is loose so I can't wind it or set the time. And I would like to replace any parts that are needed with original parts (is that possible?). Anyway I'm shopping around the local area (Chattanooga, Tn.) for a repairman as qualified as you seem to be. I don't have much to go on. By chance do you accept repair work through the mail? If not do you happen to know of a good repairman in my area?